With a 4-0 victory over the Tampa Bay Lightning in Game 7 on Wednesday night, the Washington Capitals punched their ticket to the Stanley Cup Final to take on the Vegas Golden Knights. TSN’s By the Numbers takes a look at the tale of the tape between the two teams ahead of puck drop in Game 1 on Monday night. It will be the sixth time in history that two teams are each chasing their first-ever Stanley Cup, but one club has waited significantly longer than the other. 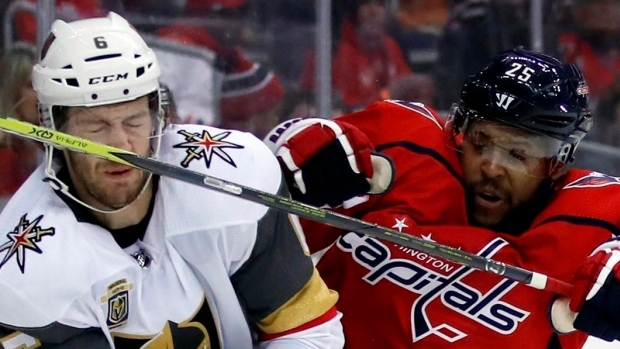 The Capitals are looking to raise the Stanley Cup for the first time since entering the league 44 years ago in 1974, while the Vegas Golden Knights are on an unprecedented run to the Cup Final in their first season in the league. Much of the Golden Knights’ postseason success has come on home ice, where the team is 6-1. But Vegas is pitted against the best road team in the playoffs. The Capitals are 8-2 away from Capital One Arena and have a chance to break the record for most road wins in a single postseason. The Capitals also have dynamic offensive force Alex Ovechkin, who has scored 607 career regular-season goals prior to playing his first Stanley Cup Final game. Ovechkin trails only Dale Andreychuk’s 634 scored before making his Stanley Cup Final debut with the Tampa Bay Lightning in this category. Ovechkin’s 607 goals are also 339 more than the Golden Knights have in team history, the largest career goal gap between a player and an opposing team in Stanley Cup Final history. However, the Golden Knights have one of the hottest goaltenders in Marc-Andre Fleury between the pipes to oppose Ovechkin and the Capitals. Acquired from the Pittsburgh Penguins at the expansion draft, the 33-year-old has had a resurgence in Sin City, leading the Golden Knights to the final with a 12-3 record, 1.66 GAA, .947 save percentage and four shutouts. Fleury is aiming to capture a third-straight Stanley Cup and fourth overall.